The XP 150 is one of the best XPs ever made. Even though the styling is from the stone age, the performance of this gun still amazes most people. It looks like its little brother, the XP 75, and it doesn't suffer flying tank syndrome. The pressure chambers are bigger than the ones mounted on today's XPs, which gives it a longer shot time. The screw on tank annoys most people because it can do damage the thread on the water tank. This gun is tough! When I was little, I never took care of my blasters, a SS 50, a XP 110, and my XP 150, but only the XP 150 survived, proving it's a really durable gun. Its colors are better than most blasters. I think that this is a great gun, and most will agree. Many people describe the XP 150 as the best XP soaker; and it certainly can be it. Its large pump volume gets pressure with ease and the its two pressure chambers give it a long shot time. The main downside is the tank--it must be removed completely to refill it. 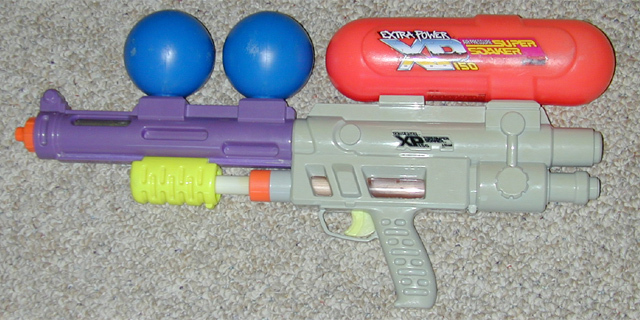 In all, the XP 150 is a great medium-size water gun.